Feb. 17, 2012, 1 p.m. The nonprofit news site is one of the first to try Apple’s new app to compile its writing, photos, videos, and more into an ebook. By Justin Ellis @JustinNXT Feb. 17, 2012, 1 p.m. It was a little over a month ago when Apple had its big publishing/education announcement and introduced the world to iBooks Author. At the time Josh predicted that the shiny, user-friendly app would make it relatively easy for news organizations to compile their journalism into ebook form. And now we’ve got some proof. The nonprofit St. Louis Beacon just produced Meandering Mississippi, an ebook that collects its writing, photos, and video on last year’s record floods. Taking your best coverage and converting it into an ebook isn’t new, but the Beacon may be one of the first news organizations to do so using iBooks Author. The book, now available for 99 cents in iTunes, weaves together a narrative stemming from the Army Corps of Engineers decision to breach the Birds Point levee, flooding more than 100,000 acres of land in an attempt to save the town of Cairo, Ill. Across 54 pages, the Beacon combines the text of its stories with slideshows, audio, interactive graphics, and video interviews to try to enhance the storytelling. “The text carries the basics and the meat of the story, but having all these extra elements to add to the book really make it stand out,” Brent Jones, the Beacon’s display editor, told me. Jones assembled the book himself and described it as a mostly pain-free process, one he said even editors with little design knowledge could use. He relied heavily on the templates that Apple provides, but he says there’s plenty of flexibility for those with who want it. The workflow will look familiar to anyone with experience with other Apple apps like Keynote or Pages, he said. Assembling the package was made easier by the fact that most of the flooding package was already assembled for a printed magazine product the site gives to its donors. Jones simply had to go back over the multimedia elements to see which would fit in the story and how they could be best used within the book. He decided to decouple an audio slideshow, for instance, splitting it into a solo slideshow and an audio track to use in a different part of the book. “It all goes back to the story you’re trying to tell and making sure you’re using the new tool and all the features within that tool to support the story,” Jones said. Jones said he downloaded the app on the night of the announcement and mocked up two pages of the book for his iPad. The next morning, he took the book into work to show his editors and got the green light. It took Jones about a week to put the book together, mostly working from home. (iBooks Author only runs on Mac OS X Lion, which Beacon computers didn’t have installed — but his personal machine at home did.) But after that things stalled for a bit. It took a little over two weeks for the book to go through Apple’s publishing process, which is known for being slower than, say, Amazon’s for the Kindle. Aside from having to provide the necessary information for payment and other authentication, Jones said he’s not sure why the process took as long as it did. Still, the Beacon found it to be a relatively quick process that fit in fairly easily to its workflow. The Beacon isn’t placing any expectations on the ebook; it’s using it as a kind of test balloon to see if readers are willing to pay or if they like reading in the tablet format. As a wholly different media from the website, ebooks could offer a lot of opportunity for the type of work the Beacon does, Jones said. They just need to find out if there is an audience for it. “It’s a good example of what we do — looking more deeply into stories and sticking with stories over a period of time,” Jones said. POSTED Feb. 17, 2012, 1 p.m.
Ellis, Justin. "St. Louis Beacon test drives iBooks Author with “Meandering Mississippi”." Nieman Journalism Lab. Nieman Foundation for Journalism at Harvard, 17 Feb. 2012. Web. 18 Apr. 2019. Ellis, Justin. 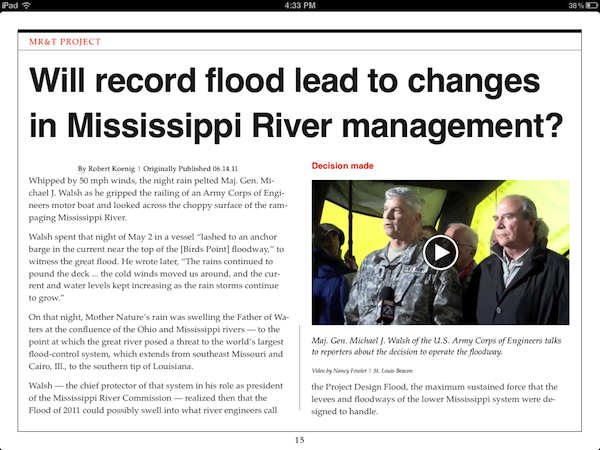 "St. Louis Beacon test drives iBooks Author with “Meandering Mississippi”." Nieman Journalism Lab. Last modified February 17, 2012. Accessed April 18, 2019. https://www.niemanlab.org/2012/02/st-louis-beacon-test-drives-ibooks-author-with-meandering-mississippi/.